What a cute outfit! Love those pants! Sending you best wishes, and hope you recover quickly. Oh dear! I'm behind in reading your blog - I hope you get wonderful news and are on the mend soon! Cute outfit, it certainly is a happy set. You are amazing! There is no way I could concentrate enough to accomplish any sewing. That said, this is completely adorable. What a blessing to be skilled enough to sew something wonderful to distract yourself. Cute, cute, charming outfit! I'll say a prayer for you as you wait for your medical reports. Navigating the medical system takes guts and perseverance. Best wishes and luck for a speedy recovery. And thank you for sharing. How adorable! I'm so glad you were able to distract yourself just a wee bit during this stressful time. It's hard to be sad looking at such a happy print! Best wishes and a great little outfit - makes everyone happy! Pam - so adorable! Be well. I'm giving you lots of relaxed, healthy vibes. Hope that this outfit made you smile as much as it did for me. 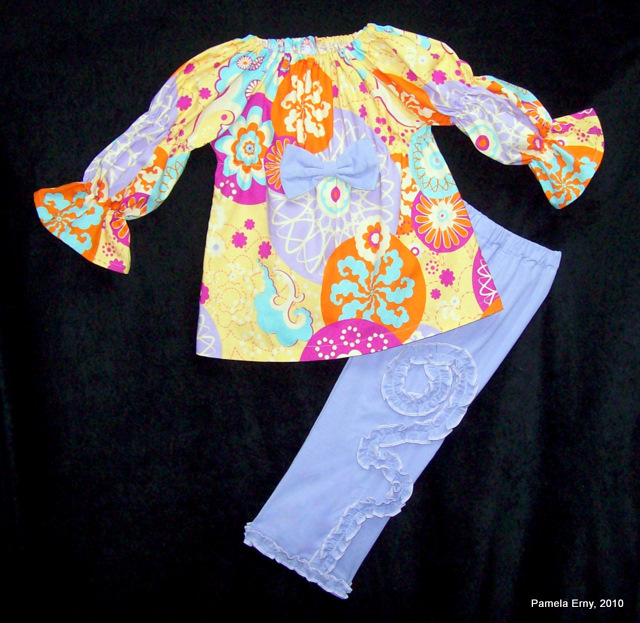 Such a cheerful fabric and a preciouse variation on the pants. Nice outfit, Pam. I'm going to add my best wishes as well for a happy report from Pathology. That outfit will bring a smile to the wearer and everyone who sees it!! Great outfit. I love the ruffle embellishment. It adds so much to the outfit. Keeping you in my thoughts and prayers for a good outcome. I can't imagine not being happy sewing up that outfit! I do hope you get a good report. Sewing something fun and pretty usually puts me in my happy space. Glad it worked for you! I think the outfit is adorable. Very cute outful as always. It is so nice to hear from you. I'll keep my fingers crossed for you to have a "good" path report. Have you started any treatments yet?